I plucked Henry up from the store car cart because he was screaming uncontrollably. He couldn’t calm down, so I carried him to the car while the rest of the family finished shopping. On the way to the car I noticed he’d peed through another diaper. His sobs slowed as we waited in the car, and I tried to push aside some worrying things I’d seen the past couple of weeks. Henry’s morning diapers, and often the sheets, were soaked. One night we had mashed potatoes for dinner, one of his favorite foods, but he said he was full and went downstairs to play. As I was cleaning the table, he came back upstairs and stuffed handfuls of mashed potatoes into his mouth. I didn’t chastise his bad manners because I was caught off guard by this wild animal look of hunger in his eyes, like he was suddenly starving. Over the weekend, he went back to bed and played on the iPad after his usual breakfast of whole grain waffles and syrup with a side of blueberries. The next coupe of days he came home from daycare asking for glasses of milk, something he didn’t usually drink. My more rational self thought this was a sudden growth spurt coupled with a strange, irascible toddler phase; after all, Henry was just three. However, my mother was an E.R. nurse, so the more irrational, fearful side thought, this kid has diabetes. I’d grown up hearing stories of people choking to death on peanut butter and strange brain tumors where the only sign is an unexplained smell of coffee, so surly the hypochondriac in me was taking over. Henry couldn’t have diabetes since type 1 and type 2 diabetes did not run in our family; besides, Henry was too young for the traditional age of onset. On a Tuesday Henry asked for water before bed. I gave him a glass with an inch of water in it. He drank it down, handed it back and said, “I want big water, mama.” I filled the glass to the top, thinking I’d just see when he’d stop drinking. In three gulps the water was gone. He handed me the glass and asked for more water. On Wednesday Henry had peed through another diaper during a preschool nap. I called his doctor’s office and told them I thought my son had diabetes. The receptionist told me this was very rare and not likely. She said the first opening was next Tuesday, six days away. I told her we’d be there tomorrow at 9 a.m. when the office opened. 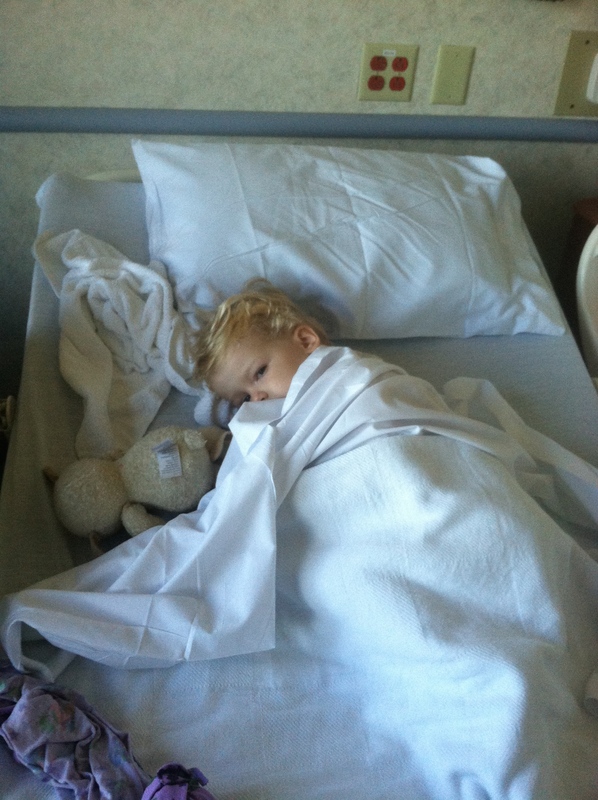 My husband took Henry in and explained to the medical staff our suspicions of type 1 diabetes. The staff seemed dismissive and told Matt that Henry probably just had a cold and was drinking more because he was dehydrated. Matt pressed and the doctor took a urine sample and returned too quickly. She didn’t have to say anything because the look on her face confirmed our worst fear. He was spilling sugar in his urine. Blood tests were taken, and after securing care for Henry’s older sister we packed our bags and headed to the primary children’s hospital in our state, an hour and a half away by car. That day my husband and I tested each other’s blood sugars with Henry’s new meter. We counted carbs, held our son down and gave him insulin injections. We learned how to rescue lows with carbs and how to use glucagon. We were given a number to call in case we had questions. We left the hospital just 24 hours after admission, armed with a cooler full of insulin, cheese sticks, and sugar free jell-o. We drove against a dark, early March prairie to a life that just a day ago was not imaginable, but now was ours, his. 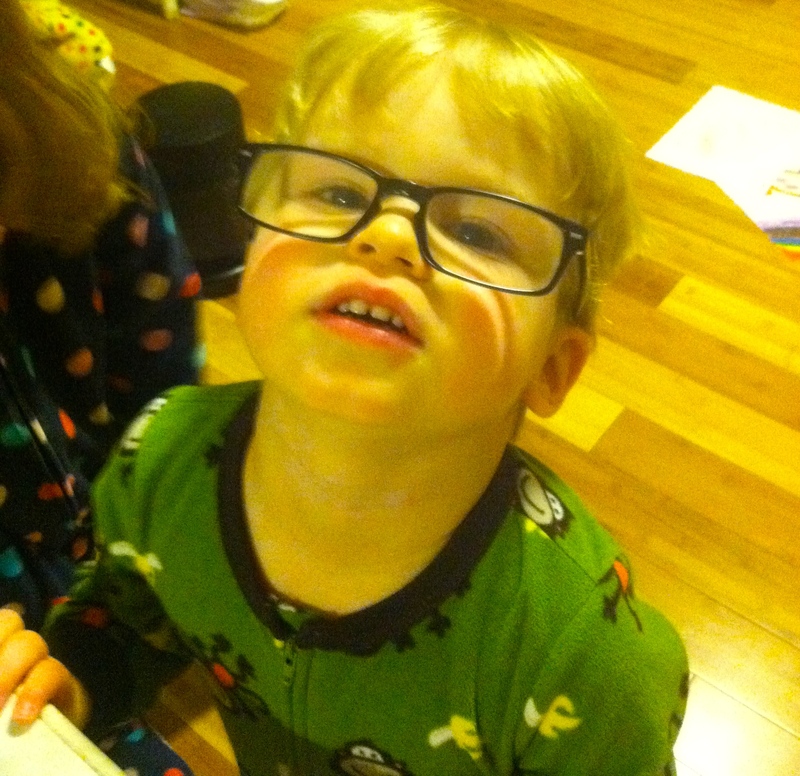 Six days after diagnosis in his papa’s glasses. Brave young boy and wonderful parents. As a diabetic myself I feel his pain and frustration which I am sure will follow. Many blessings on you and your family and Braveheart Henry. I have just found your site. Can I tell you that I was diagnosed just before my 4th birthday. I was that child begging no more injections. But that was all 54 years ago. I have 2 healthy children in their 30’s I am still healthy, have no eye, foot or kidney problems. So I can truthfully tell you that life does go on after diabetes is diagnosed.